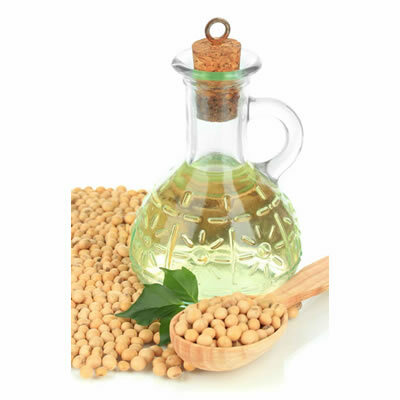 Soybean oil is a form of polyunsaturated fat used in baking. Polyunsaturated fats are fatty acids containing more than one unsaturated or double bonded carbon within the molecule. Polyunsaturated fats, along with monounsaturated fats, are considered healthy fats to consume because of their cholesterol lowering affects. At room temperature, polyunsaturated fats typically remain at a liquid state. Like all fats, polyunsaturated fats contain 9 calories per gram. Polyunsaturated fats, in conjunction with monounsaturated fats, should total between 25 to 35% of a daily total caloric intake. By substituting trans fats or saturated fats with polyunsaturated fats, cholesterol levels are reduced resulting in greater cardiovascular health and longevity. Most notably, consumption of polyunsaturated fats reduces the chances of developing heart disease by lowering bad cholesterol levels in the blood. The double bonds within polyunsaturated fats denote the health benefits of such fats because the double bonds assist in eliminating hydrogen atoms. Such a property also explains the liquid state of polyunsaturated fat versus saturated fat, which remains solid at room temperature. A health comparison can be visualized by imagining an unsaturated, smooth liquid fat or a solid lump of saturated solid fat digesting in the body. The unsaturated liquid fat is obviously a much more body-friendly fat source. Polyunsaturated fats also provide a source of omega-3 and omega-6 fats that the human body cannot create on its own. Essential fats such as omega-3 and omega-6 must be consumed through a healthy diet in order to promote proper brain function as well as aid in healthy growth and development. Soybean oil, vegetable oil, corn oil, and fatty fish such as salmon are good sources of polyunsaturated fats. Fish oil supplements can also be integrated into the diet to provide the benefits of essential fat consumption. Within the baking industry, vegetable oil is a primary source of liquid fat to provide a tenderizing affect to breads, muffins, rolls, cakes, and cookies.